Beyond the rhetoric of “waves” as used by the media in their narrative of migration flows to Europe lies a different and more complex reality, a reality beyond wars, extreme poverty and political persecution. The UNHCR 2014-2015 data estimates the number of refugees in the world between 14 and 15 million. There are, however, forced migrants who are not well-known, mostly because they are hard to express in numbers, not protected by international law, or complex to understand: environmental migrants. Environmental migration is largely internal migration, among which 19.2 million people who were forced to move due to natural disasters in 2015. Besides natural disasters however, there are other types of forced environmental migration which are difficult to assess. These often remain off the grid since there are few statistics available, and its causes are multiple and become only slowly visible. For instance, droughts and large development projects (such as dams) have been responsible for tens of millions of displaced. 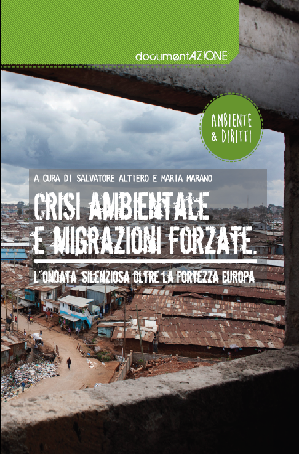 On this theme, a report was produced by the Italian organization ‘A Sud’ – which deals with issues related to ecology, environmental conflicts, north-south cooperation and environmental eduction – in cooperation with ‘Un ponte per…’. It was written with the intention of offering not just a collection of data but also a political reflection on the theme of environmental migration. In the second part the Iraqi Marshes and the Save the Tigris Campaign are featured as a case-study of dams, pollution, reduced water flows, climate change. In their article, Toon Bijnens and Johanna Rivera of the campaign advocate for the urgent preservation of the Iraqi marshes. The Marsh Arabs have the right to remain in their places of origin and live in an environment that is sustainable. Current environmental migration from the Marshes is stemming from the Iraqi state’s negligence to implement an integrated water management policy and its failure to demand a fair transboundary water agreement with neighboring Turkey, and Iran. Global environmental justice is a powerful tool to address these human rights violations of forced environmental migration. Its enforcement however depends upon local and national dynamics in Iraq. The Save the Tigris Campaign demands environmental justice and the protection of the human right to access to water in the Iraqi Marshes. The advocacy efforts by the campaign and the demands from local residents in the marshes demonstrate how the right to water and international law can be used as a strategy for environmental justice and advocacy against forced migration in the case of the Marsh Arabs in Iraq.